Small RNA are involved in numerous biological process and linked to a wide range of conditions. For example miRNA can be used for detection of cancers from blood samples and are used for cancer classification. They are involved in the regulation of the messenger RNA translation. The small RNA transcriptome is a vast world rich in information. There are not only miRNA but other small RNA that can also be used for diagnostics. For example, Repetto et al in 2015 (doi: 10.1186/s12916-015-0489-y) discovered novel small RNA in blood, s-RNY1-5p as a diagnostic biomarker for atherosclerosis-related diseases. The authors used small-RNA sequencing with the innovative CleanTag technology. Trilink Biotechnologies, the modified nucleic acid experts, have developped the CleanTag technology and they have integrated it into a Small-RNA library preparation kit to ensure the quality of the complete workflow until sequencing. It is based on modified adaptors that highly reduce dimer formation. Thus, as shown on the figure above, there are no significant dimer reads. Furthermore, the kit allows you to build a library from only one 1ng of total RNA. This sensitivity should be very helpful for biomarker discovery from liquid biopsies and other samples with limited amount of RNA. The CleanTag technology is available in a convenient and easy-to-use kit compatible with Illumina sequencing. No need to be an expert, so researchers can bring ready-to-run preparations to their favourite NGS platform. The Trilink team is also preparing a new version for Ion Torren. Interested in learning more about CleanTag? 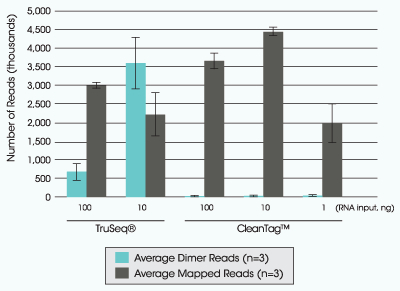 If you’d like more detailed technical information on the CleanTag technology, I invite you to download the article ‘Improve NGS Small RNA Library Preparation by Preventing Adapter Dimer‘ by the Trilink Biotechnologies team, Shore et al 2016.